This budget template is the perfect tool to get a handle on your monthly spending and start saving for the future. Everyone has financial goals, big or small. Maybe you’re saving for a new house or even just a new car. The Budget Calendar is here to help you step-by-step. It will guide you through all of the information needed to analyze your income and expenses and come up with an amazing savings strategy. Just download the free file at the bottom of this page to get started. You’ll begin by entering your income information in the top left corner of the page. There is a space for the amount you want to budget and your actual income as well. 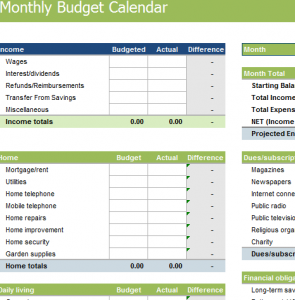 The template has conveniently broken down major expenses into separate categories highlighted in green. The template includes a section for: home, daily living, transportation, health, holidays, monthly fees, entertainment, and so much more! All of the gray areas are spaces that will provide you with calculations so there is no need to type anything in them. Once you have your Monthly Budget sheet packed and ready to go, you can print the document for later review. Simply press the “File” button at the top of the page and select “Print”.